Anybody who knows me knows of my admiration for Abraham Lincoln. I even have Doris Kearns Goodwins' book, Team of Rivals, the source material for Tony Kushner's screenplay for Lincoln. We know so much about the 16th President's life, but it was genius to focus on this great man's fight to abolish slavery. What made it even more poignant was that he did it in the last few months of his life. The cinematography is beautiful, the screenplay full of humor. Lincoln was a very funny man, after all. (The movie shows even his Cabinet members were getting tired of his folksy stories. One even admits to not understanding what the Prez was talking about.) It is a gripping history lesson as well. There's the usual gridlock, partisan politics, even bribery and patronage jobs. (I would watch C-Span all day if politicians still talked the way they do in the movie.) And it was interesting to see how ordinary folk could just go to the White House and speak to the POTUS. What was appalling was the prevailing attitudes and ideas of the day about slavery and equality of the races. To modern ears, the politicians' arguments against the 13th Amendment would make you cringe. According to IMDB, Mr. Spielberg "has explained that during the movie's climactic scene in which the names of House of Representative members are being called to vote on the 13th Amendment, the names of many of the men who voted 'No' --for various reasons--were actually changed in the film so as not to embarrass the living descendants of these men whose reputations might have been stained by their negative vote-casting." The scene where Lincoln quotes Euclid to his telegraph operators will make you reach for the tissues. He is clearly anti-slavery, but surprisingly, there is a later scene that expressed his conflicted feelings about racial equality. 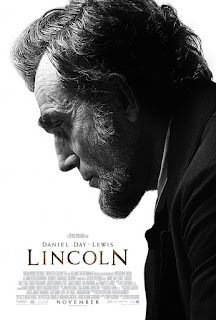 Daniel Day Lewis is certain to get an Oscar nomination (if not outright win) for his portrayal of our 16th President. He is our era's Lincoln. We see a pragmatic, masterful politician. We learn that even Honest Abe would resort to a little misinformation to get those votes. I see possible Oscar nods for Sally Field ( I'm feeling more sympathetic towards Mary Todd Lincoln after this. ), and Tommy Lee Jones as Thaddeus Stevens, a Republican who truly believes that blacks are equal to whites. The outstanding supporting cast includes David Strathairn as William Seward, Hal Holbrook as Preston Blair, Bruce McGill as Edwin Stanton, Lee Pace as Fernando Wood, James Spader as W.N. Bilbo ( a lobbyist working to get the Amendment passed), and Joseph Gordon-Levitt as Robert Lincoln. His insistence on joining the Union Army leads to a startling, heartbreaking confrontation with his father. I was afraid Steven Spielberg's film would come out too fawning (although I admit it would be hard for any director to make anything but a too-reverential film about the President. ), but the result is a riveting political thriller that humanizes an iconic figure. We need more statesmen like Lincoln, who just wanted to do the right thing.